Happy-Go-Lucky’s Sally Hawkins triumphs in an intimate portrait of a modest artist’s life. How do you find happiness if the cards are stacked against you? 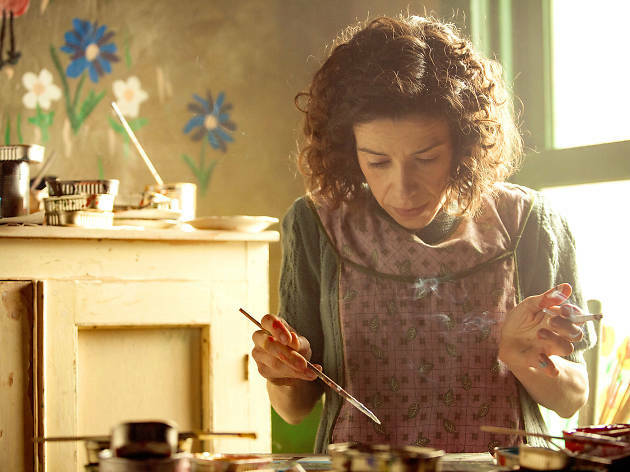 Director Aisling Walsh’s cozily affecting Maudie—the true-life story of the beloved Nova Scotia folk artist Maud Lewis—doesn’t directly broach this question. Yet its answer comes in the form of a disarming, tear-jerking payoff that sneaks up on you. As unassuming and gentle as its subject, Maudie breaks your heart with its infectious positivity and an outstanding Sally Hawkins, who can always be relied on for an emotionally sturdy, big-hearted performance. We first meet Maud, a smart, competent and partially disabled woman (she’s a little hunched over), in the late 1930s amid vast rural landscapes, picturesquely lit by cinematographer Guy Godfree. To break free from her overbearing family, she responds to an ad for a live-in maid, placed by grouchy hermit Everett (a committed, burly Ethan Hawke), who lives in a tiny box of a house and runs a business selling fish. These odd outcasts don’t quite have a meet-cute and aren’t a match on paper, yet they form a unique, loving companionship over time. In their rockier early days, Maud blocks out Everett’s routine petulance by habitually painting happy murals of the countryside on the walls of their charming shack: flowers, cats, chickens. Her art grabs the attention of sophisticated New Yorker Sandra (Kari Matchett), who compels Maud to hone her craft further. (They develop a friendship that begs for more screen time.) The artist’s fame grows, reaching far beyond the confines of their small world. Refreshingly, Maudie quickly proves it has no interest in becoming a heavy-handed art biopic, à la Pollock, nor a schmaltzy, formulaic one that exploits the physical shortcomings of its heroine. 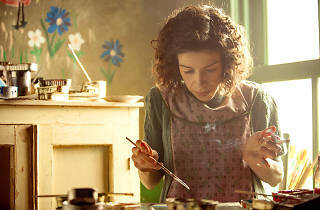 Like Maud Lewis’s paintings, it instead celebrates life’s simple pleasures with no pity for its small-time characters. The film glows with the kind of sweetness last seen in John Crowley’s Brooklyn. All it asks of you is an open heart.